I still remember the good old days when invisi-firing was still a thing. In one game, I shot at a GK (played by a -K- member) and despite the fact that I did less than 10k dmg to him, he was forced to kite away from cap. The pure PSYCHOLOGICAL threat of akizuki truely made the ship OP. Now, with the the HE pen buff, the PSYCHOLOGICAL threat of akizuki becomes a real threat. WG essentially turn the 100mm armed DD into DPM cruisers which are effective against ALL sorts of targets. As long as you shoot a good armount of shells per game with a good percentage of hit ratio, you will have a good dmg game and you will have a significant impact on the outcome of the game. 100mm he shells pure dmg is 1200 x 0.33 = 396. 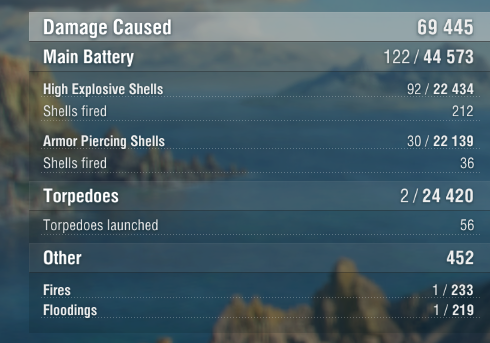 Lets say average 1000 shells fired with 30% hit ratio, you will have 300x396=118800 dmg. Lets also factor in dmg saturation, shells that land on thick armour belt and such, The average dmg may range from 70-90k. 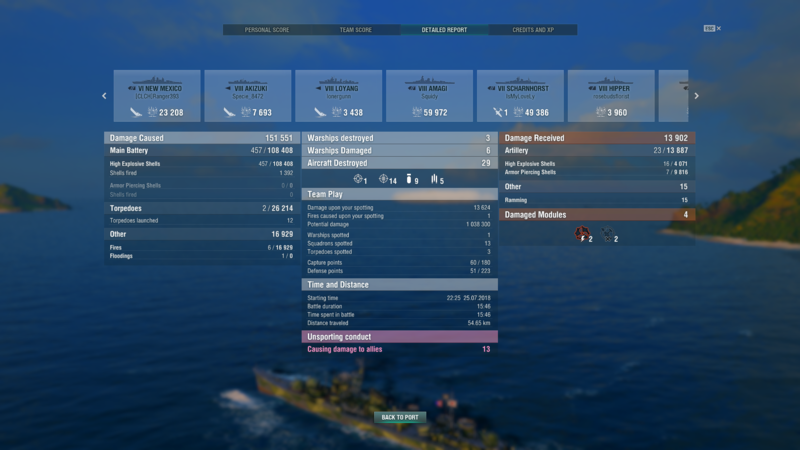 The T8 DD average dmg on NA server range from 25k to 35k (excluding Asashio which is still a relatively new ship). Just imagine what can a Kitakaze and Harugumo do, so, yeah. The screenshot is my 2nd battle in this version of game. Yep essentially this is an example of that. I can't decide if this is pure cancer or just what DD players need to over come the radar meta. Unfortunately its both, which doesn't bode well for game balance at the moment. It depends now it could be cancerous to the player that isn't doing to great on the opposite team. Yet it can be a great thing for that player who wants to tick someone off and have a bit of fun. The 100's are turning into quite the troll guns of the game. The only people who have "psychological" problem with Akizuki is the ones that fights them at medium range. Why even give Akizuki the option to fight at optimal range? Fact remains, the awful slow speed and turn rate is the deadliest downside the the Akizuki and future ships of that line. People will first hype, because pew pew fast pew pew, then they realize they can't outrun a cruiser and will drop the line. Well you sold me, I'm going to start working on this line AS SOON AS POSSIBLE. Akizuki became a lot nicer. I feel the pen should have been 1/5th rather than 1/4th though. With IFHE, that would only allow them to nip most cruisers. I bet my harekaze is gonna be even better now with this buff considering I run it with the 100mm. but without the super fantasy armor or the super fantasy engine OR the super fantasy 3D print-itself repair but at lower tier. Are you saying Khabarovsk should be nerfed hard too? Khab could do with a reduction to its 10kt fantasy buff over it's actual designed speed, using a fictional powerplant on the level of Yamato's somehow. At least cut it by 5kt. Then transfer some of that speed to Shimakaze and Le Fantasque/Terrible. Went out in my Harekaze a few times today. 4-10 hull with the 100mm guns. She a little bit more potent now.... Not up to Akizuki's fire power, gun range, and HP Pool but faster, more nimble, carrier twice the torps and those fire more often.. You pretty much can't take a torp from much of anything out there, and you better know how to work the margins of your torpedo and surface detect range... But yea, guns are definitely more effective. I wouldn't call her OP, but if you know what your about you can have a knuckle cracker of a match in one. 100mm ifhe gunboat in this version of the game is far superior to USSR gunboats in every single possible way. The reason is very simple, even with ifhe, 130mm of USSR gunboats CANNOT pen 32mm. Therefore, ships like khaba rely heavy on fire dmg (RNGesus) to do dmg. the frequent dmg you will get from khaba gameplays can be breaken down to 1/3 or 1/4 of he dmg and the rest is fire dmg. 100mm ifhe gunboats however, just need to land hits to do dmg. No RNGesus is invovled. so if a cruiser rush you, he/she will just make fool of himself/herself like the gentleman in atago in the screen shot. 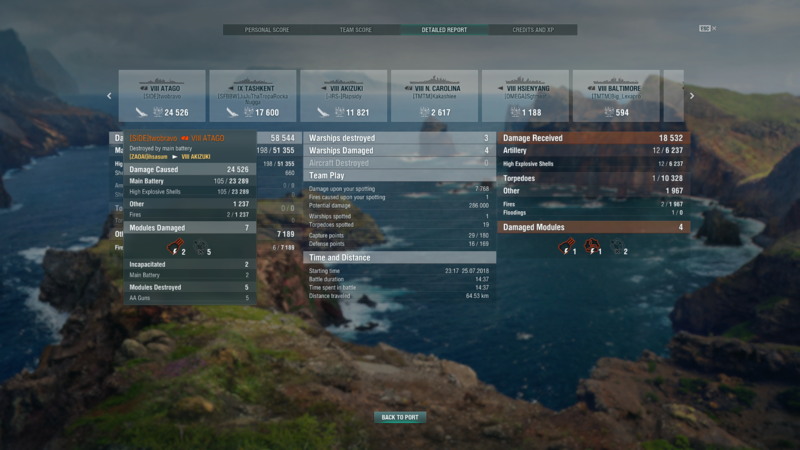 I see no reason to play t8 USSR gunboats or above JUST from a dmg farming point of view. BTW, i played 4 games in the buffed Akizuki and my avg dmg is 100k. So, why play kiev? those USSR gunboats are good, but IJN gunboats are just better by a large margin. RU Gunbotes are faster and more nimble than IJN Gunbotes... RU Turret traverse is better, their AP shells penetrate more armor. Only thing IJN Gunbote has on RU is health, rate of fire, and HE Pen. Range I am not sure about. RU Destroyer can still shred Akizuki. I own Akizuki but I don't play her enough, so this is kind of a neutral observation to me. The big, extra damage by IJN 100mm due to the 25mm HE pen buff doesn't surprise me. WG essentially turned these fast firing 100mm guns to pen better than Non-IFHE 152mm guns. Matter of fact, they essentially gave it 155mm HE pen values (i.e. Mogami-155). If Akizuki gets to be top tier, good night lower tier ships. The 25mm HE Pen Buff means even Tier VI-VII BB decks that 'Zuki encounters are ripe for pillaging. The only thing more hilarious now is if WG comes out with an IJN BB featuring lots of long ranged 100mm Secondaries Kii doesn't count, her 100mm guns don't go far enough. That assumes the IJN remotely gets any decent BBs that aren't downtiered and nerfed for a different gimmick. Which we all know is unlikely to happen. More seriously though, the only BB planned with such was Shinano and the later Yamato-hulls, where they replaced the 127s with 100s, and redistributed armoring to better protect the citadel and lighten up the turrets some for faster traverse. It doesn't mean it can't happen; especially with a possible BC/Fast BB split or a second slow BB line, but it's unlikely to ever happen in Premium form. Oh no, one destroyer is actually kinda good. Better nerf it into the ground. Being real for a second: Akizuki's agility and turn rate are terrible and she's very large. If you're being shot at by an Akizuki and can't hit it, you have no business being in any tiers that can encounter it anyway. Because if you can't hit a 33 knot cruiser with a cruiser's rudder shift and a battleship's turning circle, that's not the fault of the Akizuki. it makes no sense that a 100mm weapon has better penetration values then every other larger DD caliber gun in the game . I get it, but its not something I agree with. The Number 13 design has alternate IJN fast BB line tier 10 written all over it. I imagine that the 460mm guns would be a researchable option, since iirc the historical design had 457mm guns. NavWeaps says 460mm/50 was planned for Number 13, separate from Yamato's 460mm/45. Assuming WG uses the /50 with the shells of Yamato, it just means slightly faster shell velocity. Which would actually make sense for only 8x 460mm guns. And she'd be easier to balance than Conqueror by virtue of the 460s at least able to overmatch. Stick with the same 2.0 sigma, a typical box citadel with slightly trollish armor (but like all IJN BBs, vulnerable if they bare their broadsides at the wrong time, not some below water citadel), and a reasonable 30-31kt speed, and she can be a solid harasser at T10. Throw in 10cm DPs with 11km range like Republique if they want to (aka optional), more for defensive utility, but could rush in and perform a nasty cruise-by shootout in a pinch like Amagi can. 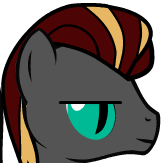 She also won't be as maneuverable as Conqueror, nor have Conqueror's hellish 457 HE, so she won't be brutalizing everything. You should make a video of how you play the Akizuki. I have yet to figure it out, myself. Lots of smoke firing without a threat of radar is the only way I see this ship working. @sbcptnitro simple. priority targets, preventive maintenace, incoming fire alert, last stand, demonlition expert, bft, aft and ifhe. play aki like atlanta. you hide behind rock, don't cap even when your teamates yell at you and report you. You start shooting at bb, ca, dd from absolute safety. keep shooting until they are all dead or flee away from caps. AND then you sail into caps, smoke up and keep shooting while capping. the key point here is you trade cap points early in the game for a lot of kills. when the enemies are so down on firepower and hp pool. they can't stop you from taking the caps and turn the tide of the battle. I send replays to LordZath's replay theatre from time to time. maybe you can find my aki/kitakaze/harugumo replays in the future. The Khaba was actually "designed" to go 47 knots. Take that number with a grain of salt as the ship never came close to being built....but the notion the Khaba is significantly over performing its "real life" design speed is a myth propagated by a bunch of people incorrectly assuming the Khaba was based off the Project 47. Where on earth that idea ever came from is beyond me....as the Project 47 looks nothing like the Khaba. The Project 47 was designed to have ten 130mm guns (or six 152mm guns), and was 20 meters longer with over 50% greater displacement than the in-game Khabarovsk. I think the most likely explanation stems from the fact the design the Khaba was based off (The Project 24) does not have its own Wiki page and is only briefly mentioned in the Russian Wikipedia article about the Project 47. My guess is someone linked this Wikipedia article as the source for the Khaba's real life inspiration, and then people who don't speak Russian and didn't read the whole article incorrectly assumed the Khaba was based on the Project 47. Still....that doesn't explain how they managed to scroll down and find the Project 47's listed max speed, with out noticing the rest of the ship looked nothing like the Khabarovsk.